I have been eating overnight oat porridge in the past weeks, for losing weight. No more eating out breakfast at McDonald or IKEA Cafe, I determined to shed away the unwanted fat! However, I really need to go out early in the morning tomorrow, I couldn’t stay back for oat meal breakfast… there suddenly had an urge to bake some cookies. I guess I could just bring some cookies out with me tomorrow morning, and to have these cookies for tea in the next two weeks! How about these in trend lactation cookies, for nursing mums, as well as diet watchers. I wasn’t worry about the calories and sugar intake from cookies as I was the one who made and controlled the ingredient content! 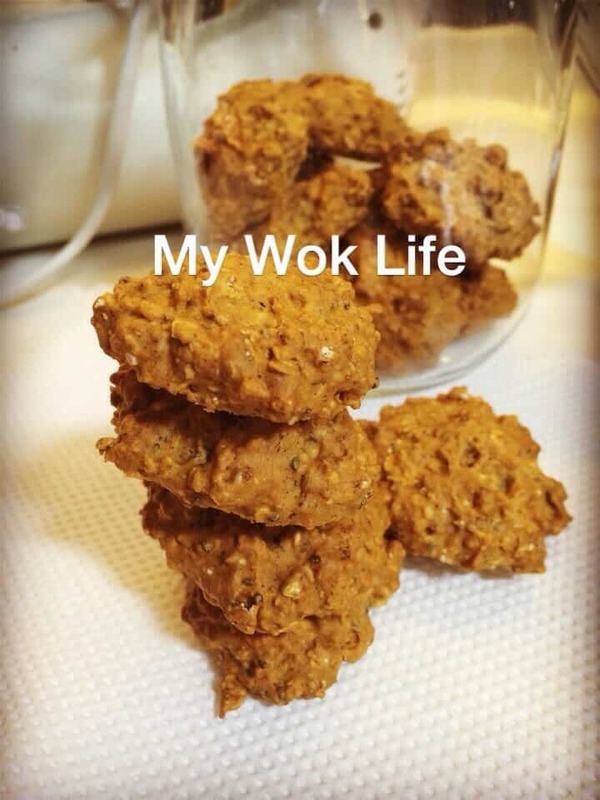 Yes, due to my desperation in losing weight, my homemade lactation cookies were tailored to the need of weight losing, too. See, it’s nice to be able to enjoy some ‘sweet goodness’ during dieting, isn’t it? And don’t forget, this is not normal sweet treats, it’s lactatio cookies, for everyone! Oh yes, offer it to your growing kids as well, these omega-rich (from the seeds & lecithin added) cookies would make your smart kids even smarter! Below is the cookie dough on greased tray before sending in oven to bake..
(1) In a large mixing bowl, add plain flour, baking soda, baking powder, salt, sugar and coconut oil. Mix them using low speed. Add milk, and alternate with eggs while mixing. Do not over beat the batter. Stop when all ingredients are well combined. 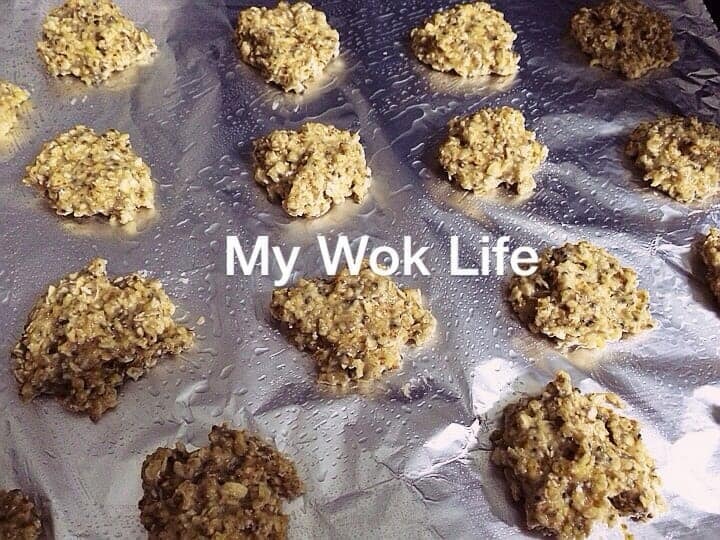 (2) Fold in rolled oats, Chia seeds, flaxseed meal and lecithin, by using a spatula. By now, the batter should appear thick and sticky dough. (3) Grease baking tray with a layer of oil. Use a metal spoon, scope a ball of cookie dough (about the size of a golf ball or slightly bigger) and place on greased tray. Use the back of the metal spoon to lightly press on the dough to make it slightly flatten for easy baking. Repeat step till all done. (4) Let the cookie dough rest for 15 – 20 minutes. In the mean time, preheat oven on 175deg Celsius. (5) Place trays in oven and bake for 25 minutes or until cookies are browned and crisped. When baked, let them cool before storing in the jar, or serve. It was so aromatic during the baking process. The cookies aromas emerged the whole house this evening. When done, I tasted my lactation cookie. It was more to the bland side due to reduced amount of sugar and it’s butter-less, but still yummy as a dieting indulgence! See my freshly baked (below), was still cooling in tray.. If you like your cookies to be more crisped, extend the baking time to another 10 minutes, but watch out the baking to prevent burning or over baking ya. If you like it a little softer or more doughy, bake for a mere 20 minutes or until light browned will do. Tips: Sugar adding can be from 50g – 80g, for diet watcher. Otherwise, it should be 150gram for a ‘real taste’. 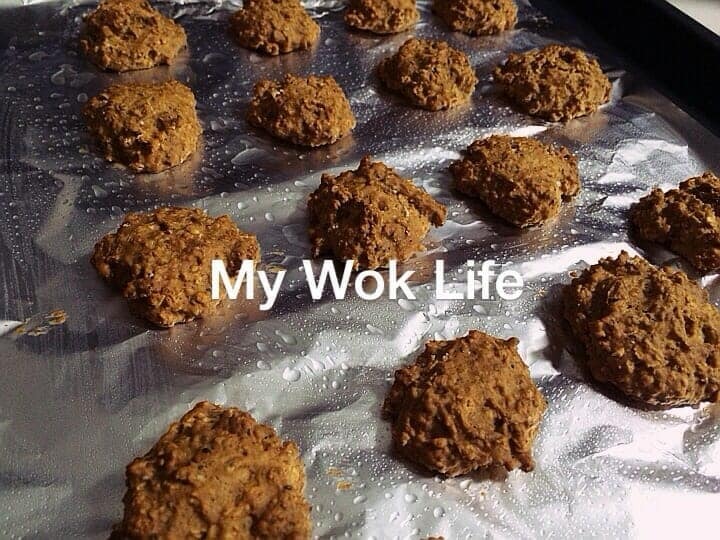 * Do not over beat the eggs, else the cookies will turn too doughy. * May add raisins to sweeten, if preferred. 1 – 2 tablespoons, but do not over bake the cookies with raisin, else the raisins will become too hard. So, I recommend 18-20 minutes with smaller cookie size. Hi! May I know where can I purchase the flaxseed meal and lecithin granules? Thanks! Hi! Many supermarkets sell these. I got mine from Cold Storage.